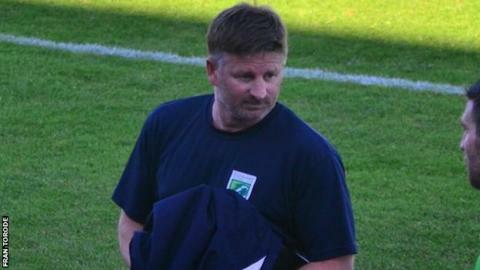 Guernsey FC boss Tony Vance has criticised his players after their 4-1 loss at Chatham Town. Ross Allen gave Guernsey a 38th-minute lead, but the home side equalised two minutes later before going on to score three goals in a nine-minute spell in the second half. "It's not acceptable," said Vance. "I've got to apologise on behalf of everybody because it's not good enough. "I'm really angry because we had more than enough to get a victory." The loss was Guernsey's fourth in their last five Isthmian League Division One South games, during which the club has let in 16 goals. The island side had won five of their six matches prior to their recent run. "You can play all the pretty football that you like, and all the good build-up play and all want the ball, but you've got to do the basics like tracking back," Vance added to BBC Radio Guernsey. "That's what we did so well when we went on a run of five or six games, but over the past few games it's just not been there and people have been a bit selfish with the fact that they're not putting a shift in when they should. "Everyone's got to be accountable, and I put myself top of that list because I'm the one that's asked, but it isn't for the want of trying. "Over the last couple of games you've only got to look at the goals conceded and that tells a story."